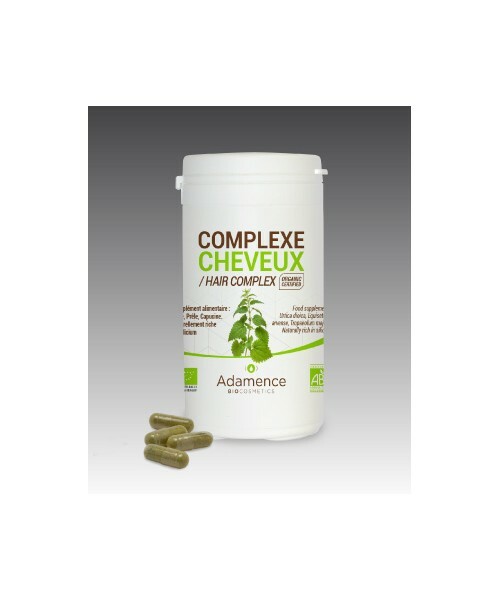 This food supplement based on Urtica dioica, Equisetum arvense, Tropaeolum majus extracts is an indispensable asset for hair growth. 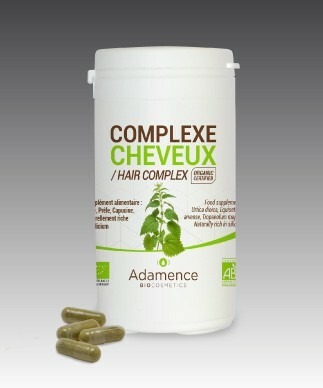 The composition of this capsules fights against baldness, promotes hair growth and cellular activity. Urtica dioica : vivifying and stimulating action, fortifies hard keratin (essential protein of the hair). Hair will be remineralized and reinforced, will recover a natural shine. Decreases the secretions of sebum, slows down the appearance of dandruff. Equisetum arvense : fortifies, helps to fight against hair loss, strengthens the hair, remineralizing action. Tropaeolum majus : cleanses the scalp and slows the hair loss, invigorating action. 2 capsules daily, in the morning, with a glass of water (jar of 60 capsules). Cure of 3-6 mois minimum. The coating of the capsules has a 100% vegetable origin.